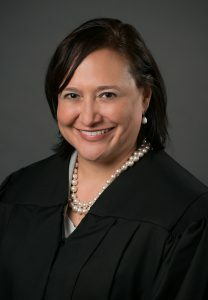 Ana L. Escobar was elected to the General Sessions Court in August 2018. Judge Escobar was born in Colombia, South America and became a United States citizen when she was twelve years old. She and her family have lived in Nashville, Tennessee for over forty years. Judge Escobar earned her college degree from Vanderbilt University and graduated from The National Law Center at George Washington University with a Doctor in Jurisprudence. Prior to her election, Judge Escobar has practiced law since 1995 by serving as an assistant public defender, an assistant district attorney, solo practitioner, Metro Clerk, and Deputy Director of the Administrative Office of the Courts. Judge Escobar has a passion for public serve. She has served on twenty non-profit boards, government boards, and commissions. She has given her time to the Planning Commission, the Davidson County Election Commission, the Board of Equalization, and the State Judicial Nominating Commission. In 2012, she co-founded MyCity Academy, a leadership program that enables New American Nashvillians and neighborhood leaders to learn about Metro Government. Judge Escobar is honored to be serving the citizens of Davidson County.